Où que tu sois et 24h/24, BlueFish Radio tesuit partout - sur ta tablette, ton smartphone - au boulot, envoiture ou à la maison... BlueFish Radio, c'est tous tes hits etnouveautés préférées ! Nous varions notre programmation musicale ette balance le meilleur de tous les gros hits et les gros succès dumoment. C'est pour cela que BlueFish Radio est incontestablement LAradio des Hits, la seule, et l'unique ! En plus de pouvoir écouter ta radio, envoie ton messagedirectement depuis l'application et rejoins-nous sur Facebook,Twitter et Instagram. Wherever you are and 24/7, BlueFish Radio accompanies youeverywhere - on your tablet, your smartphone - at work, in the caror at home... With BlueFish Radio, it's hits music only ! We varyour music grid and give you the best of all greatest hits and besttunes of the moment. This is why BlueFish Radio is undoubtedly THEHits radio station, the one and only ! In addition to listening to your radio, send your messagedirectly from the app and join us on Facebook, Twitter andInstagram. Wherever you are and 24h/ 24, BlueFish Radio follows you everywhere - on your tablet, yoursmartphone - at work, in the car or at home ... BlueFish Radio isall your favorite hits and new! We vary our music programming andthe best of you balance all the big hits and the big hits of themoment. This is why BlueFish Radio is undoubtedly THE Hits radio,the only and unique! In addition to listening to your radio, sends your messagedirectly from the application and join us on Facebook, Twitter andInstagram. Wherever you are and 24/7, BlueFish Radio Accompanies youeverywhere - on your tablet, your smartphone - at work, in the caror at home ... With BlueFish Radio, it's only music hits! 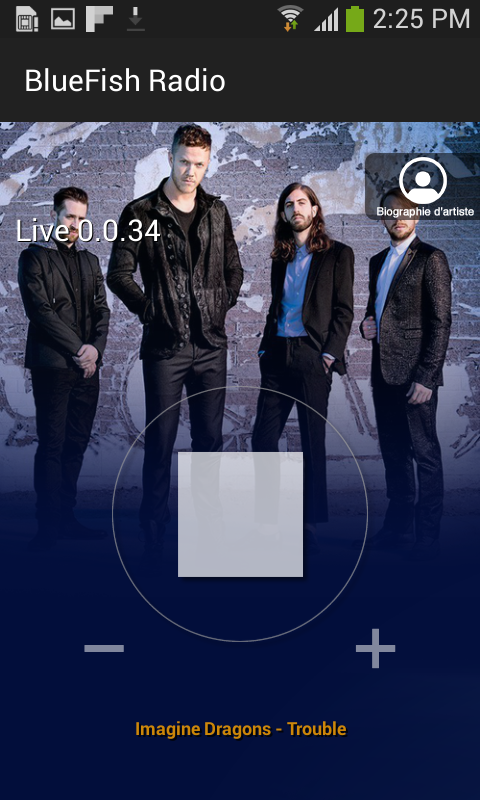 We varyour music grid and give you the best of all greatest hits and besttunes of the moment. This is why BlueFish Radio is undoubtedly THEHits radio station, the one and only! In addition to listening to your radio, send your messagesDirectly from the app and join us on Facebook, Twitter andInstagram. 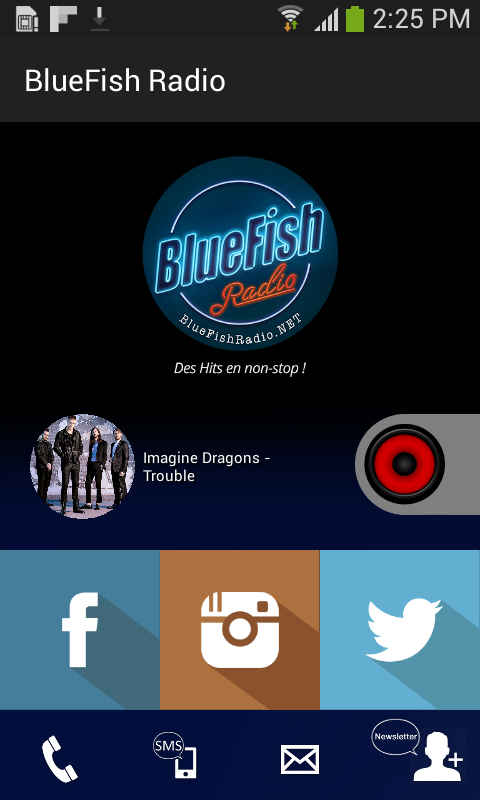 Où que tu sois et 24h/24, BlueFish Radio tesuit partout - sur ta tablette, ton smartphone - au boulot, envoiture ou à la maison... BlueFish Radio, c'est tous tes hits etnouveautés préférées ! Nous varions notre programmation musicale ette balance le meilleur de tous les gros hits et les gros succès dumoment. C'est pour cela que BlueFish Radio est incontestablement LAradio des Hits, la seule, et l'unique !En plus de pouvoir écouter ta radio, envoie ton messagedirectement depuis l'application et rejoins-nous sur Facebook,Twitter et Instagram._______________________________________________________________________________________________Wherever you are and 24/7, BlueFish Radio accompanies youeverywhere - on your tablet, your smartphone - at work, in the caror at home... With BlueFish Radio, it's hits music only ! We varyour music grid and give you the best of all greatest hits and besttunes of the moment. This is why BlueFish Radio is undoubtedly THEHits radio station, the one and only !In addition to listening to your radio, send your messagedirectly from the app and join us on Facebook, Twitter andInstagram.Wherever you are and 24h/ 24, BlueFish Radio follows you everywhere - on your tablet, yoursmartphone - at work, in the car or at home ... BlueFish Radio isall your favorite hits and new! We vary our music programming andthe best of you balance all the big hits and the big hits of themoment. This is why BlueFish Radio is undoubtedly THE Hits radio,the only and unique!In addition to listening to your radio, sends your messagedirectly from the application and join us on Facebook, Twitter andInstagram._______________________________________________________________________________________________Wherever you are and 24/7, BlueFish Radio Accompanies youeverywhere - on your tablet, your smartphone - at work, in the caror at home ... With BlueFish Radio, it's only music hits! We varyour music grid and give you the best of all greatest hits and besttunes of the moment. This is why BlueFish Radio is undoubtedly THEHits radio station, the one and only!In addition to listening to your radio, send your messagesDirectly from the app and join us on Facebook, Twitter andInstagram. myBlueFish, l'application indispensable pour vous au quotidien!myBlueFish est une application intelligente qui vous tientinformés des publicités en ligne (ePub), les tendances du marché etdu divertissement...Vous aimez les promotions, les bons plans, lesnouveaux produits? Découvrez nos meilleures offres, sélectionnéesspécialement pour vous grâce à cette application.Cette applicationmobile vous concerne: tous les grands passionnés du monde de la pubet du web, ceux qui investissent de près ou de loin dans la pub,les agences médias, les agences de communication, les annonceurs,les marketeurs, les consultants... et vous, les Mobinautes !Si vousn'êtes pas abonné à BlueFish, vous retrouverez gratuitement danscette application:1. Les pubs du jour classées par catégorie – àvous de choisir les catégories qui vous intéressent ! 2. LaGalerie: Les pubs / les spots vidéos / les spots radio & lesbrochures en ligne (eBrochures)3. News&Mews: un concentré dumeilleur du web avec vidéo4. Les évènements sponsorisé parBlueFish5. Abonnez-vous: Recevez les 'BlueFish eCampaigns'directement par mail6. 'Subscribe' et rejoignez la Communauté !Unesuggestion, une remarque, n'hésitez pas à nous contacter.myBlueFishthe essential application for you every day!myBlueFish is a smartapplication that keeps you online ads (ePub), market trends andentertainment ...Like promotions, special offers, new products?Discover our best offers, specially selected for you through thisapplication.This mobile application about you all the great fans ofthe world of advertising and the web, those that invest directly orindirectly in advertising, media agencies, advertising agencies,advertisers, marketers, consultants .. . and you, the mobileusers!If you have not subscribed to BlueFish, you will find free inthis application:1. pubs Day categorized - You choose thecategories that interest you!2. The Gallery: Pubs / video spots /radio spots & online brochures (eBrochures)3. News & Mews:a concentrate of the best of the web with video4. The eventssponsored by BlueFish5. Subscribe: Receive 'BlueFish eCampaigns' byemail6. 'Subscribe' and join the Community!A suggestion, a remark,do not hesitate to contact us.